Jonathan Shurberg kindly passed along a tip that absentee ballots are waaay up in CD8. He’s right, and that could have an impact on our congressional primary. The state’s Board of Elections has released absentee ballot statistics by congressional district and party. CD8 has about one-eighth of the state’s population. But among Democrats, it has accounted for 27% of absentee ballots sent to voters and 25% of absentee ballots received by the state. The Board of Elections also reports absentee ballots by state legislative district. Among Democrats, the five legislative districts from which the state received the most absentee ballots are all partially or entirely inside CD8. Legislative District 16, home to high turnout precincts in Bethesda and Chevy Chase, is the runaway leader. Legislative District 20, home base to Senator Jamie Raskin, ranked fifth. 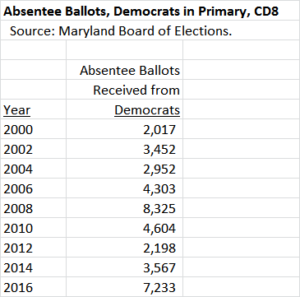 Below are absentee ballots cast by Democrats in CD8 primaries from 2000 through 2016. The lead year for absentee voting was 2008, a record-breaking primary across the state which saw a contested election for President. This year’s primary is set to be at least number two on this measure. A caveat applies: CD8’s boundaries were significantly changed in 2012, as it lost many high turnout precincts in Potomac and gained many less-Democratic precincts in Frederick and Carroll Counties. Accounting for that fact, the absentee returns in 2008 and 2016 are in the same ballpark. Another thing: mailed absentee ballots with postmarks on or before election day will be accepted by the state through May 6, so more ballots will be received. The competitive presidential primary between Hillary Clinton and Bernie Sanders is definitely responsible for part of this spike. Competitive presidential elections draw out voters like no other down-ballot offices do. But we also hear that David Trone’s campaign has been running an aggressive absentee ballot program. This is part of Trone’s strategy to expand the electorate beyond regular Democratic voters. 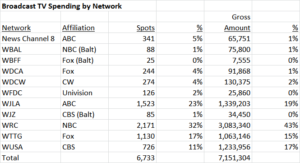 By mailing to registered Democrats who do not get mail from other candidates, saturating televisions, laptops, tablets and smartphones with ads and even advertising on Baltimore TV stations, Trone is betting that he can turn out voters who hear primarily or only from him. That’s his strategy for victory, and the absentee ballot performance may be a sign of it. If Trone is deadlocked for the lead with another candidate at the end of tonight, don’t be surprised if the absentee ballots give him a win. Congressional District 8 has three strong Democratic candidates with a chance to win. One of them is Total Wine co-founder David Trone. 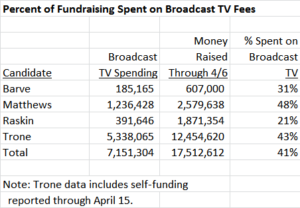 Let’s start with the obvious: Trone has accounted for two-thirds of all funding in the race and three-quarters of broadcast TV spending. He leads the field in mail and digital ads too. As David Lublin has written, his campaign has been well run and professional. Trone’s rags-to-riches life story is compelling and will appeal to many. He is running as the outsider candidate in a year in which outsiders have seen success at the presidential level in both parties. He is running against PACs and lobbyists more than he is against his opponents. (Only PACs and lobbyists could rival the current Congress in unpopularity!) And Trone has been an active campaigner at the retail level, appearing at Metro stations and many events. Trone had a bad start, openly saying “I sign my checks to buy access” when questioned about why he contributed to Republicans and having to apologize when his campaign sent a spy to the Matthews and Raskin offices. He is pilloried by Raskin loyalists and some of his opponents for his self-funding. He is not a natural politician and has had to learn the ropes quickly. He was unknown in the district in the beginning (boy, has that changed!) and has no local political history. And he is not as good a fit for the district’s electorate as a liberal state senator or a telegenic, professional woman. But Trone’s financing as well as the competent campaign operation he has built virtually overnight make him a big factor in this race. Because of his resource advantage, Trone doesn’t have to run a targeted race – he can communicate with everybody. His television and digital ads go out to regular voters, casual voters, non-voters, members of other parties and non-residents alike. His mail program can reach out to all registered Democrats. Raskin’s base will never abandon him and many women will go for Matthews, but there are thousands of Democrats in the district who know only one candidate: David Trone. If turnout is high and is not based just in the Downcounty areas that are the home of the district’s liberal, high-information voters, there will be lots of people who will vote for President, know nothing of Congress, and vote for U.S. House candidates based on little more than name recognition. This is the antithesis of the scenario most favorable to Jamie Raskin – a large, casual, mixed-ideology electorate who come from Carroll, Frederick and Upcounty nearly as much as they do from the Beltway region. If that happens and turnout approaches 2008 levels, David Trone could be going to Congress. Congressional District 8 has three strong Democratic candidates with a chance to win. One of them is District 20 State Senator Jamie Raskin. Raskin has successfully established his brand as the effective, results-oriented progressive in the race, and he uses it as a contrast against two well-funded opponents who have never held office and have no local political history. He started with a geographic base that accounted for roughly a sixth of the district and expanded it into other areas with a nearly year-long ground campaign. His supporters are passionate, knowledgeable, loyal and numerous. It would not be a stretch to say that he has wrapped up close to 90% of the district’s regular Democratic activists, the kind of people who play big roles in County Council and state legislative races. His fundraising has been mostly local and is competitive with Kathleen Matthews. His mail program has been second only to David Trone’s, although Emily’s List has been catching up in their advocacy for Matthews. 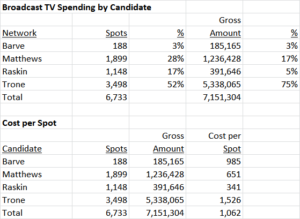 As the third-ranking candidate in terms of finances, Raskin is running a more targeted race than either Matthews or Trone. He has made a token investment in television in favor of a robust mail campaign, which can be targeted to regular voters. There is good reason for this, but let’s remember that Rob Garagiola made a similar choice against John Delaney in 2012. If turnout is high and jammed with low information voters who have not seen Raskin’s mail, he would be at a disadvantage. Also, Raskin’s dispute with Delegate Kumar Barve over an inaccurate television ad has earned him negative coverage in the Post (twice), the Sun and Bethesda Magazine during the crucial final weeks of the race. Raskin supporters tend to be very liberal, know that Raskin is very liberal, and have lots of information about the race. That message is reinforced through the grass-roots network that Raskin has built. High information voters like these almost always vote and they will have an outsize impact on a low turnout election. Turnout in Montgomery County has been trending downwards for years, and if that continues, it will favor Raskin. Under this scenario, his people will stay with him and the remaining low information voters will be divided between Matthews and Trone. Whether this will play out in the context of a competitive Democratic presidential primary is anyone’s guess, but Raskin’s base is the envy of the field and he has a good chance to win.